What Does All of This Have to Do With Test and Measurement? The convergence of voice, TV, and data has led to a need for multiple resolutions and processing methods dedicated to each and every screen (TV, PC, and mobile). Therefore, the requirements of digital content distribution have increased dramatically. At the same time, advanced compression schemes such as HEVC and mJPEG have taken hold, paving the way for delivering additional 4k and 8k content content that will have to be optimized to accommodate possible network bandwidth constraints while maintaining the best possible quality. Those factors, coupled with the onslaught of devices aimed at 4k and, soon, 8k, mean delivery networks will have to deliver 4k and potentially 8k content in all types of formats reliably and with high quality. Specifically, a multifaceted strategy for analyzing different delivery scenarios in order to understand the quality of experience viewers will have. For the past couple of years, more and more broadcasters, service providers, and equipment manufacturers have been researching the technology requirements of delivering 4k content to a wide range of services real-time TV channels delivered through cable IPTV or satellite, file-based delivery of VOD content, and streaming content over the Internet. And now some will need to do the same with 8k for specific applications. Much of the testing is designed to help make decisions about 4k (and eventually 8k) content-delivery workflows. Therefore, the testing focuses on the major areas where 4k and 8k technologies will have an impact: codecs, bit rates, and formats. In other words, a significant amount of data needs to be compiled to support decisions to select the right codecs; the optimal bit rates; the appropriate file/container formats; and the best suppliers for contribution, distribution, and archiving functions. Then, once the delivery systems are deployed, testing should continue to ensure the quality being delivered matches expectations. Given the importance of test and measurement when it comes to perfecting video-delivery equipment and scenarios, it makes sense to start with the right testing tools. First, consider the source. A typical delivery network today receives video from a number of sources, such as a program feed from its studio or a satellite network; an uncompressed or mezzanine compressed feed from WAN via long-haul service provider, or a file from a satellite data link; or a finished file from the edit suite. From there the operation puts out both high-bit-rate encoded video for broadcast and adaptive streams in different bit rates to support any number of OTT platforms. When considering a 4k or 8k video-quality testing solution, one of the most important factors is its ability to record or import a file in 4k (and possibly 8k) resolution, and then test content quality coming from any downstream compressed stream, file, or uncompressed video device. There should be a wide variety of input and output capabilities that let users test individual devices and then place them into a test network architecture either at a live broadcasting plant, a content delivery network, or in the lab of the products manufacturer or developer. 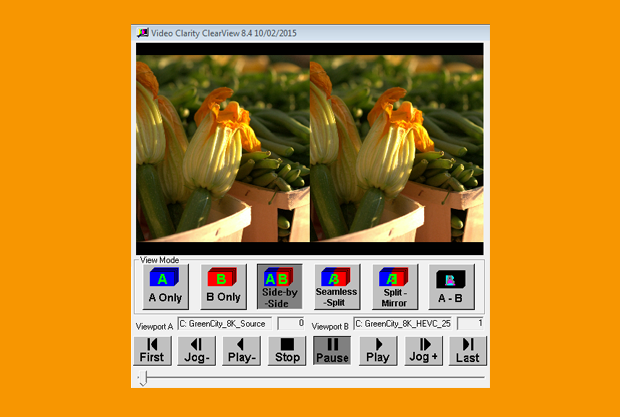 Another major criterion is the solutions ability not only to decode any encoded file, such as the latest HEVC, but to keep up with new enhancements and new codecs that come along. In addition to those key elements, the right testing tools will support the full range of resolution levels, from streaming formats for hand-held devices and PCs; to todays still-prevalent broadcast-level HD formats; to high-frame-rate HD; to, of course, 4k and 8k. Furthermore, the system must be able to play back the content, allowing the user to visually inspect it in every resolution required for delivery to every screen, from UHDTV to mobile-device resolutions. Finally, there should be an automated means of testing key attributes of video quality, audio quality, lip sync, loudness, and ancillary content. 4k technology is becoming a major factor in content creation today one that is already starting to affect other aspects of the broadcast workflow and to influence new purchase decisions. And with the rapid pace of technological evolution, 8k technology is poised to enter the picture before we know it. For that reason, having 4k and 8k testing capability for content encoding and delivery methods is critical to ensuring high quality and reliability now and into the future. The results provide valuable input to help define workflows, assemble the right combination of gear, and guide important business decisions for current and future generations of services.